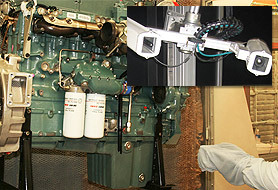 Up to now, the great variety of diesel engines for trucks and other commercial vehicles has prevented automated painting by robots, due to the very high manual programming effort required. The automationCONTROL DPS 8005.T system uses optical sensors to measure the engines in a scanning cabin, and then generates custom robot programmes that can be adapted to all types with their different attachments. The programmes are loaded into the robot's memory and then executed automatically. By scanning in a scanning cabin, the location and geometry of the objects to be processed can be recorded digitally. Based on this data, the system generates individual collision-free and singularity-free robot programmes for each object. These programmes are then run by the processing robot. The process is carried out automatically, without any manual intervention.